Description: This book contains essays on the letters and theology of the Apostle Paul from leading Pauline scholars. The majority of the essays are based on papers given in the first Finnish national seminar on Paul held in the University of Helsinki in January 2007. Finnish contributions to scholarly discussion on Pauline theology have been widely recognized as challenging and thought-provoking, particularly in regards to Paul�s view on the Mosaic Law and soteriology. Heikki R�is�nen�s view on Paul�s inconsistent thinking about Law and other topics has served to polarize discussion among Finnish scholars. The opening essay by Stephen Westerholm outlines the debate and its relation to international discussion. The essays by Heikki R�is�nen, Kari Kuula, and Timo Laato are fruits of this on-going discussion. Niko Huttunen approaches the question of Paul and the Law from the Stoic point of view, while Risto Saarinen examines its relation to the theology of Martin Luther. Other principal topics include Paul�s opponents and methodological discussion. A comprehensive way to analyze Paul�s argumentation is sought in Mika Hietanen�s essay. Lauri Thur�n examines how Paul�s rhetoric must be taken into account when deciphering historical information from his letters. His essay takes Paul�s opponents as an example. The opponents are also dealt with by Lars Aejmelaeus and Nina Pehkonen. Their essays focus on anti-Pauline opposition in Corinth and the antagonists in Philippians, respectively. 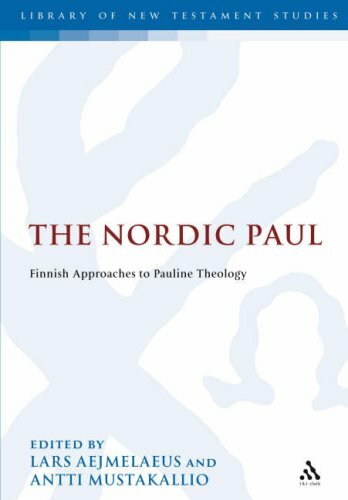 Citation: Erik Heen, review of Lars Aejmelaeus and Antti Mustakallio, eds., The Nordic Paul: Finnish Approaches to Pauline Theology, Review of Biblical Literature [http://www.bookreviews.org] (2009).